Insect bites from mosquitoes or sand-flies are widespread in the Tropics and cause diseases such as dengue, Ross-river fever or malaria. Our Eradicate Insect-borne Diseases with Light activities cover prophylaxis, treatment as well as cure. Following the “prevention is better than cure” approach my group is producing potent natural insect repellents from local essential oils. At present, DEET is used as the most common artificial insect repellent, but it is irritant, unpleasant in smell, expensive and known to damage surfaces and fabrics. For the treatment of insect bites, my team is producing anaesthetics with reported activity levels higher than those of widely used ones. The multi-step process is realized in a continuous-flow operation without any isolation or purification of intermediates, thus allowing for on-site and on-demand manufacturing. The synthesis of antimalarials from natural compounds is likewise investigated using artificial and natural sunlight. In particular, my team is developing continuous-flow photoreactors for the manufacturing of the current frontline antimalarial artemisinin. 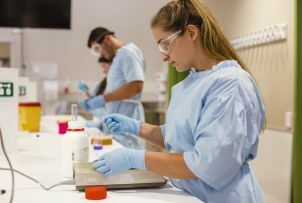 The activities or the group are embedded in the Centre for Biosecurity and Tropical Infectious Diseases (CBTID) and supported by the Clinton Health Access Initiative and the Far North-Queensland Hospital Foundation. Interest in medicinal, organic or green chemistry.